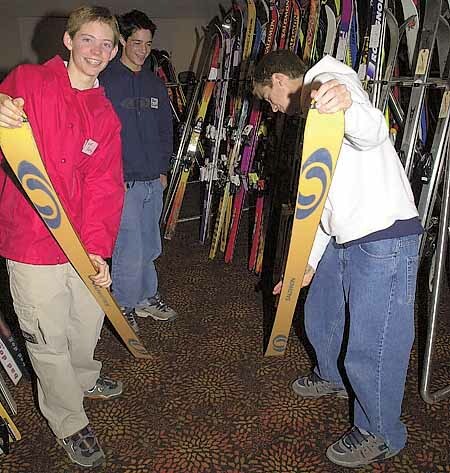 Sun Valley Ski Team members Will Roth, Frank Fiaschetti Jr., and Michael McClure volunteered their time at the ski swap held at Sun Valley over the weekend. The annual event is a major fund raiser for the Sun Valley Ski Education Foundation. Express photo by Willy Cook. "I'm not saying that domestic violence should be condoned, but the playing field needs to be well-defined"
The Blaine County P&Z is soliciting public comments on request by two landowners to allow industrial development on 50 acres of agricultural land in the Glendale area. A gargoyle on the desk of Ketchum attorney Andy Parnes represents Keith Wells' demons. What's in a law, a regulation, an ordinance, a rule? Without the nation's veterans, nothing would be as it is in the United States of America.